Today during my class at the Amauta Spanish School, Cesar introduced us to the Argentine national drink called mate (pronounced mat-ay). This is a drink often shared with friends. It is made from a rather large bunch of yerba leaves, twigs and stems (in Argentina, yerba is pronounced share-bah) and hot water. The water is hot, never boiling. 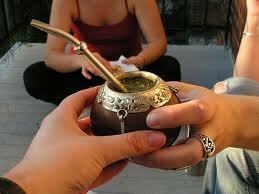 The yerba is put into a gourd and the water is added. Often it is a bit harsh or strong tasting at first, and sugar is added, and more water, usually from a thermos bottle (called a termo). It is a process to develop a smooth tasting drink, and it seems a personal, daily quest to achieve that perfect mate. The flavour of mate is reminiscent of green tea, though with a more freshly mowed lawn kind of taste. Maybe a lawn with quite a few weeds. Not to every one's liking. The metal straw is called a bombilla (pronounced bome-bee-cha). The metal straw has a filter-like thing on the end so one doesn't swallow a bunch of the yerba leaves and stems. Something to be avoided apparently. Mate is everywhere in this city, but due to the nature of personal taste, and the need to share that perfect taste, it isn't served in cafes or restaurants. It is common to see relaxing taxi drivers sharing a gourd of mate at any hour of the day or night, or to see young people in a park passing a gourd around, with its bombilla, adding hot water from a termo. Thermos bottle sales in this country must be astronomical. In every mercado I've been in, the shelf space provided yerba is as much as that offered coffee, more in some cases. Yerba mate is a big deal indeed. Great article Jim! Thanks for sharing!